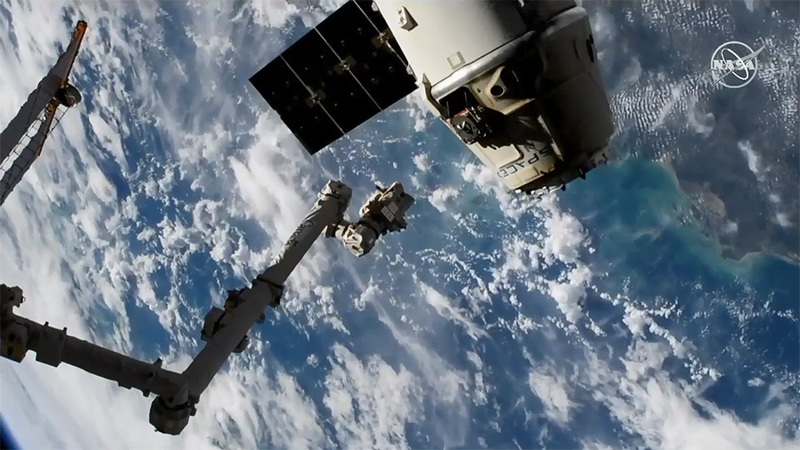 The SpaceX Dragon cargo craft is pictured moments after being released from the Canadarm2 robotic arm. The SpaceX Dragon cargo craft was released from the International Space Station today at 6:33 p.m. EST. Robotics controllers remotely commanded the Canadarm2 robotic arm to let go of the U.S. space freighter sending it on a solo trajectory back to Earth. Astronaut Anne McClain monitored the activities from the cupola and watched Dragon perform a series of departure burns as it separated itself to a safe distance from the orbital lab. Integrated operations between mission controllers in Houston and SpaceX controllers in California stop when Dragon reaches a point about one kilometer away from the station. SpaceX personnel will retrieve Dragon after it parachutes to a splashdown in the Pacific Ocean Monday at 12:15 a.m. (9:15 p.m. Sunday Pacific time) then tow it to port in southern California. This will be the first nighttime splashdown and recovery for the Dragon with plenty of moonlight to track its entry. The commercial cargo vessel is taking home a variety of critical space research that will immediately be picked up by NASA engineers and distributed to scientists across the nation. Station hardware will also be extracted for analysis, refurbishment or discarding. Dragon completes a 36-day mission attached to the station’s Harmony module after delivering more than 5,600 pounds of science and supplies on Dec. 8. Today’s departure leaves four spacecraft, including Northrop Grumman’s Cygnus cargo craft, attached to the space station. The next Dragon mission to the space station will be its first uncrewed demonstration mission designated SpaceX DM-1. The Commercial Crew Program’s first launch is currently targeted for February and will demonstrate ground systems, orbit to docking activities and landing operations. È sempre appassionante vedere ciò che fate e come con scrupolo registrare tutto.